Otto Warmbier, a University of Virginia student from suburban Cincinnati, is on his way back to the United States. Washington: North Korea has released Otto Warmbier, a U.S. university student held captive there for 17 months, U.S. Secretary of State Rex Tillerson said on Tuesday. Warmbier, 22, a University of Virginia student from suburban Cincinnati, was on his way back to the United States, Tillerson said in a statement. The Washington Post cited Warmbier's parents as saying he had been medically evacuated from North Korea in a coma. "Our son is coming home," Fred Warmbier told the newspaper on Tuesday. "At the moment, we're just treating this like he's been in an accident. We get to see our son Otto tonight." Tillerson, at a U.S. Senate hearing on Tuesday, declined to comment on Warmbier's condition. A person who answered the phone at Warmbier's family's Ohio residence said: "No comment, thank you" and hung up. Warmbier's release came as former U.S. basketball star Dennis Rodman arrived in North Korea on Tuesday, returning to the increasingly isolated nuclear-armed country where he has previously met leader Kim Jong Un. U.S. officials appeared to brush aside any speculation of a connection between Rodman's controversial visit and Warmbier's release. A senior administration official said the Trump administration did not authorize Rodman's trip. "This is him freelancing," the official told Reuters. The State Department is continuing to discuss the situation of three other detained Americans with North Korea, Tillerson said. Since taking office in January, U.S. President Donald Trump has faced growing tensions with North Korea, which has conducted a series of ballistic missile tests in defiance of U.S. and international sanctions. Warmbier was detained in January 2016 and sentenced to 15 years of hard labor in March of last year for trying to steal an item with a propaganda slogan, according to North Korean media. "At the direction of the president, the Department of State has secured the release of Otto Warmbier from North Korea," Tillerson said. U.S. 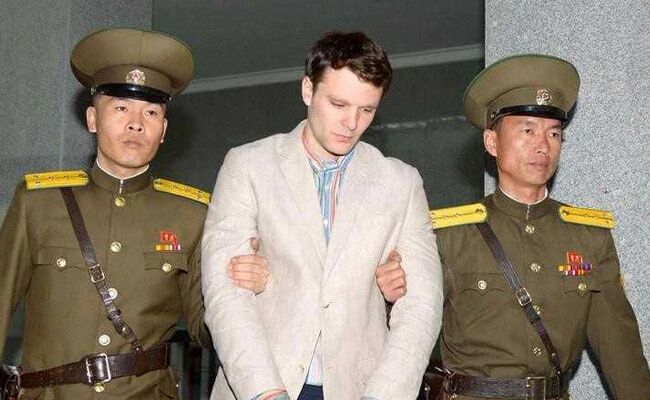 Senator Rob Portman of Ohio said: "Otto's detainment and sentence was unnecessary and appalling, and North Korea should be universally condemned for its abhorrent behavior. Otto should have been released from the start."